The Guadalupe River runs from Kerr County, Texas to the San Antonio Bay. The Guadalupe River is most enjoyed through rafting, canoeing, and fly fishing. The Guadalupe River is one of the finest rivers in Texas. 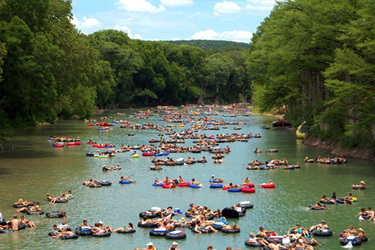 Both Young and old know the Guadalupe River as being one of the best tubing rivers for the spring and summer months. The Guadalupe River made the top 100 list of trout streams in the USA. It is the southernmost Trout Fishery in the United Sates. The River is currently being supervised by officials. The River is full of Rainbow trout, brown trout, Bass, and Perch. South of Canyon Lake, largemouth and smallmouth bass, white bass, Guadalupe bass, and the Rio Grande cichlid can be caught. Guadalupe River State park recently opened a 5.3-mile equestrian trail that can be enjoyed by horseback or mountain bike. Individuals who enjoy the outdoors will enjoy visiting the Riverside Nature Center. This Center is a non-profit arboretum with wildlife and native plant sanctuary. The Nature Center has over 140 tree species and approximately 200 species of wildflowers and native grasses. The Guadalupe River is on the United States’ Top 100 List of Trout Streams. There is a 5.3-mile equestrian/mountain bike trail in the Guadalupe River State park. The Riverside Nature Center is home to over 140 tree species and around 200 species of wildflowers and native grasses.